The X-Doria Cubit case features a snap-on-the-back design with an interesting twist: it’s customizable. Before going into my detailed review of this case, I would like to thank X-Doria for sending this case over to me free of charge for review. The Cubit case is a well designed, lightweight case made for the iPhone 4/4S. It is quite thin, yet still provides decent drop protection because of the jelly inserts located on the back of the device. However, this protection is limited to the back of the device, as the case does not have a rim to cover the front of the iPhone. The customizability of this case is out of this world! 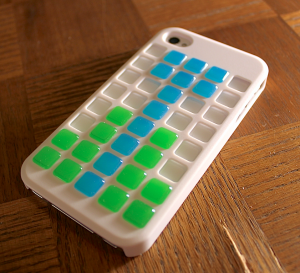 When you first take a look at the case, you’ll notice that there is a 5×8 grid on the back. This is where you’ll place the forty included jelly inserts. These inserts come in multiple colors and are made of a TPU material. You can arrange these inserts to match your personality, mood, or just to create a cool design. The possibilities are endless! When using the Cubit, I’ve found that the added grip from the “jelly” cubes makes the iPhone easier to hold. Although I’m not a fan of the lack of major drop protection, the lightweight feel of the case surely makes up for it. Finally, the customizability of this case certainly makes it stand out, as I learned from the many positive comments I received while using it. It is an especially good fit for the younger audience, because of the case’s retro look which is so popular right now. All-in-all, this case is definitely a good fit for anyone who wants minimal protection with maximum style. If you want to pick this case up for yourself, head over to X-Doria’s website. This case currently retails for $24.99. As always, check back to Tapscape soon for more app reviews, product reviews, and breaking news!